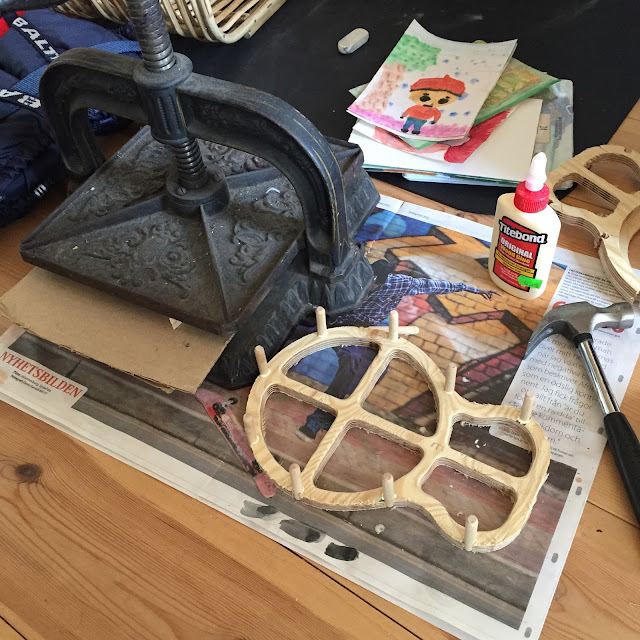 In the cottage, in the middle of the vacation, we find the old book press and the wannabe luthier eager for some action. I've shown this before but here's a pic of a resonator skeleton coming together. 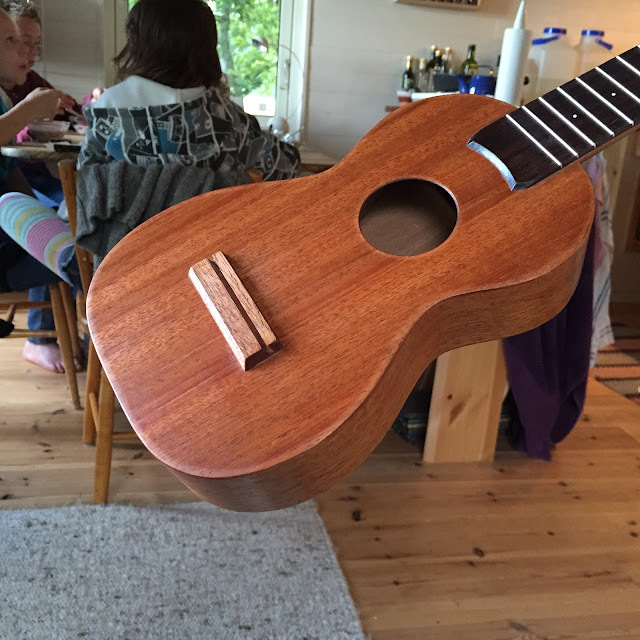 Then I decided to finish the mahogany soprano I've been busy with, you know the one with the oil finish. 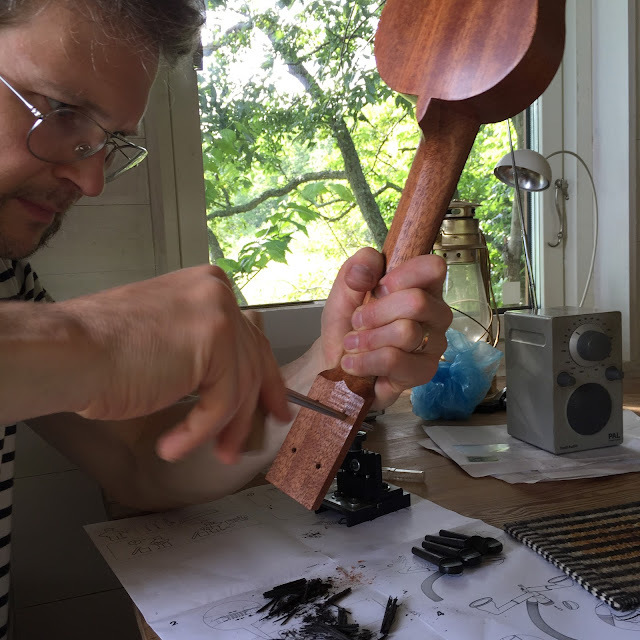 I started out by shaping the violin tuning pegs in my peg shaper, from Juzek tools and bought from www.metmusic.com, which is a very good webshop for parts and tools. I only recently mastered the tool but now I won't install tuners without it. 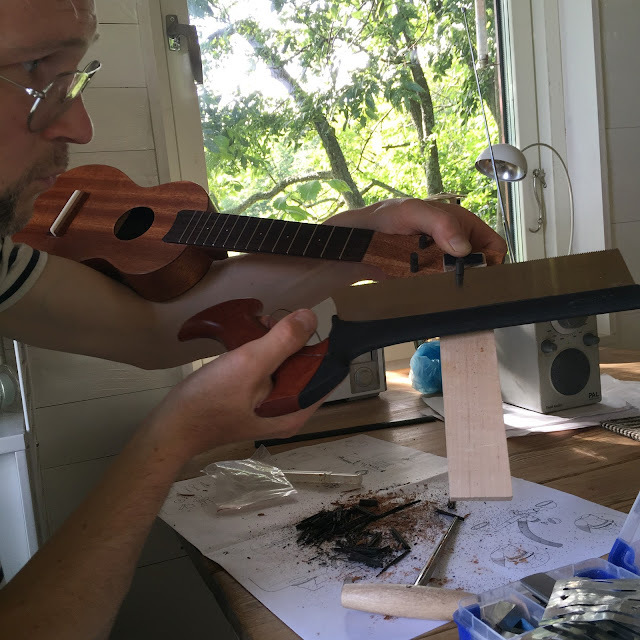 Then reaming out the holes to fit the tuners. I chose to have the C- and E-string tuners a bit further in, it makes sense when you see it. When all tuners are seated I cut them off from the front with a spacer board. Note the piece of leather that catches the saw instead of my thumb doing it. Of course a back saw like this one isn't great for flush cuts but I brought a minimium set of tools out here. And it worked well enough. Then I round over the ends of each tuner. This can be done with a file but I didn't bring a file so I carved them. Files are boring as well, don't you agree? Then some holes and strings and what do you know, it's done. Hard on the heels of number 1; number 29; number 84 and a few others made from this very special wood it already sounds great. As a side note, when I tuned it I set the A-string at exactly 440 Hz. By ear, and that's a first for me. 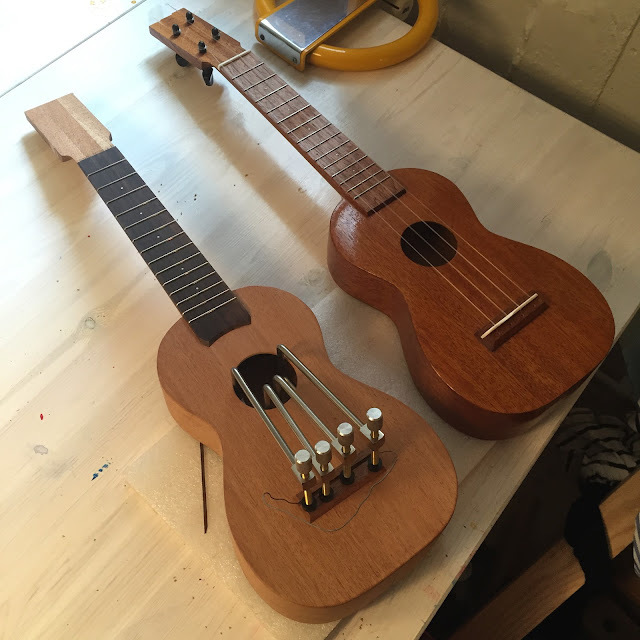 I'd put on a few coats of Tru oil on this mahogany soprano, but I wasn't 100 percent pleased with the surface. Maybe I should have sanded a bit more before finishing, I think a shellac finish would have filled some of the imperfections but the oil brought them out. Since I'm not in a rush I decided to hit the surface with some 400 and then 600 grit sandpaper. The surface got dull, of course, and I quickly got rid of some problems. Then I remembered a method I learned long ago, and even used a couple of times. That is to apply the oil with some high grit sandpaper, thus creating a slurry of sorts which should fill the pores. So I went ahead and did just that. 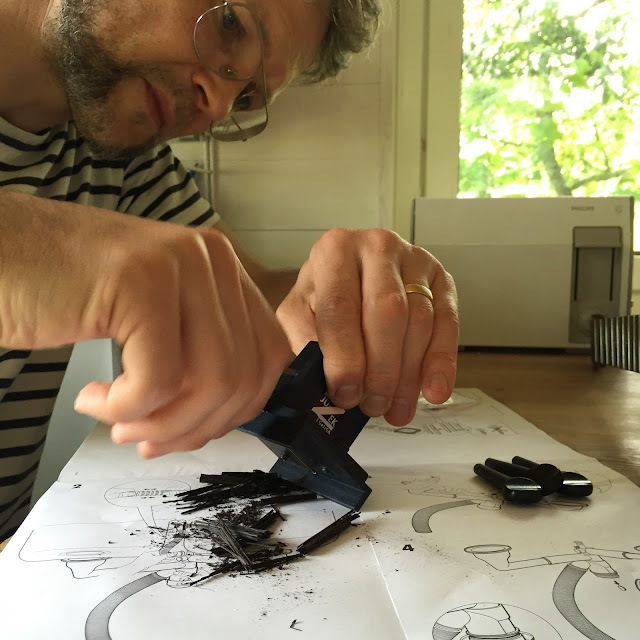 Then I remembered more - the slurry you get with Tru oil differs from the one you get with Danish oil, and that was what my wife used when she told me about the method. 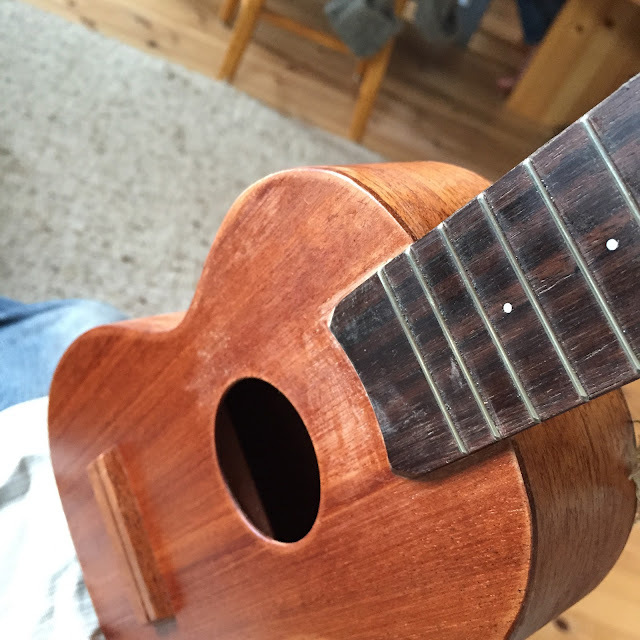 My slurry got very sticky and covered the uke with a grime that built a thick cover. Just like last time! When I told myself it would indeed be the last. But finally I recalled the last bit of hidden information in my once fully operational brain. 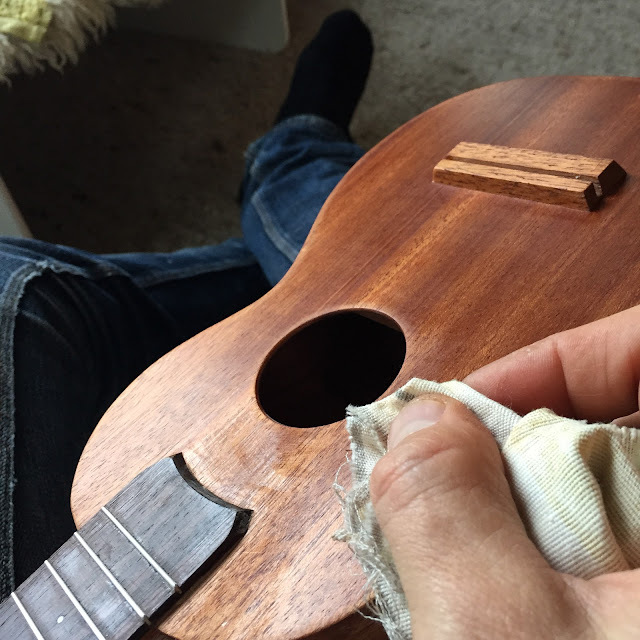 Last time I was able to rescue the uke by rubbing it vigorously with a rag. So pretending to myself that this was the plan from the start I got a rag, and my phone for taking a few pics for this blog. Ready? In the first pic you can see the top with some of the grime remaining, north of the soundhole and the fretboard extension. Now rubbing. It doesn't take long but you need to rub hard. The area next to my thumb is now shiny. But the pic, what a fugly perspective. I'll add one more for balance. Here it is, with a bit of the cottage interior in the background. Since this strange method does give results, would I recommend it? Would I use it again (even if I remember more of the process than I did today)? No, I wouldn't recommend it. 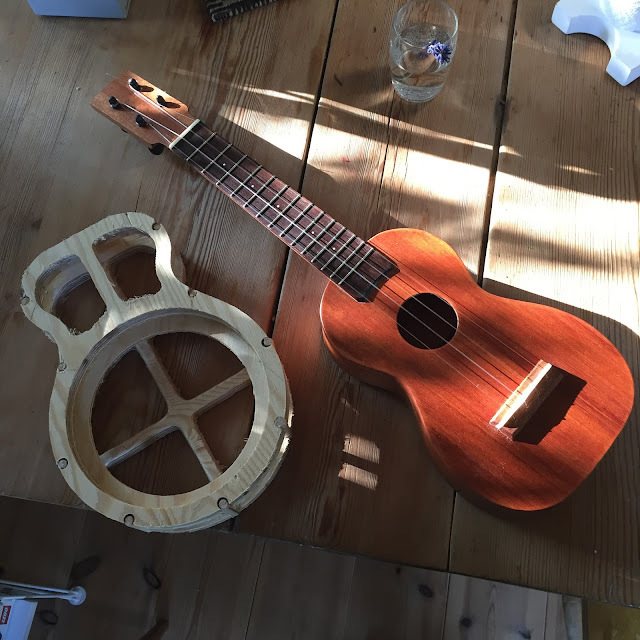 To much hard work, and I wouldn't want to recommend a process demanding such force being put on a fragile uke. Yes, I might use it again. If I wanted to use Tru oil for some reason and my surfaces weren't prepared enough. I know it works and I know what it takes. And a good oil finish rivals a shellac finish in both looks and feel. 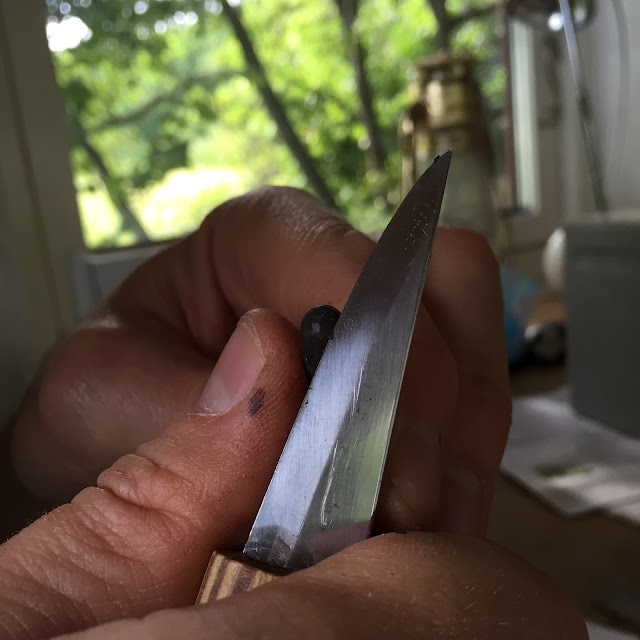 July is traditionally the slowest month on this wee blog, but we get off to a good start with the post I forgot to make yesterday. 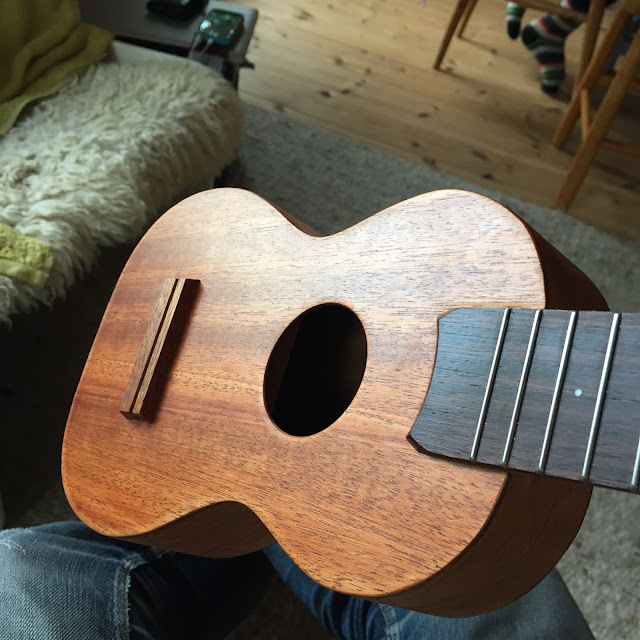 The second single plank all mahogany soprano had leapt forward despite me being off to the far side of the world, the fretboard is on, the bridge is too and now I've whipped out the Tru oil for the first time in ages. 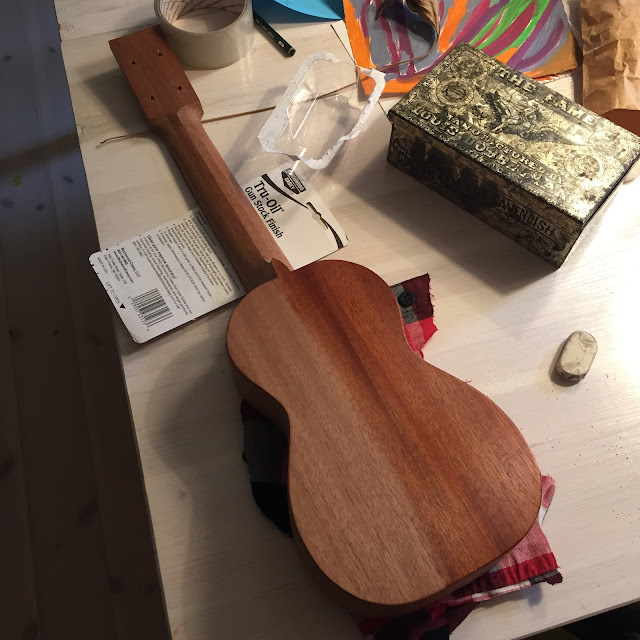 You all know my persistant struggle with shellac but the buyer of this uke asked for an oil finish so I thought it would be fun to re-visit the process. But first, here's a pic of the bridge being clamped. Then I applied the first coat of oil, a very light coat. 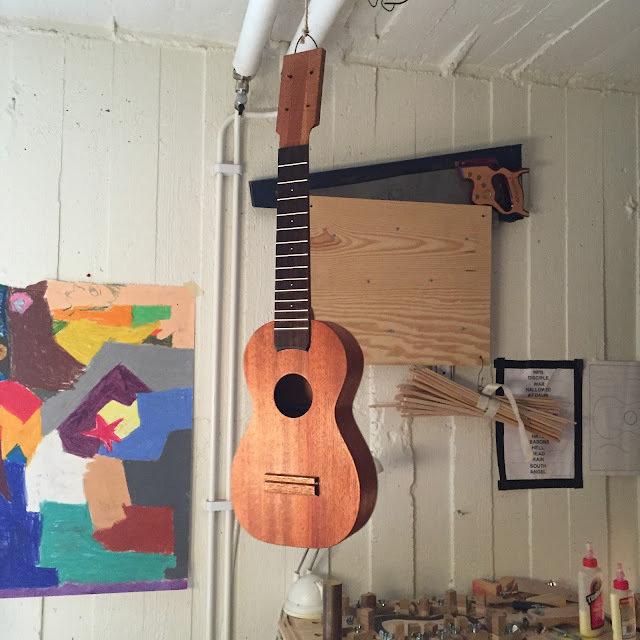 And once the whole uke was rubbed down I let it dry. I gave it a second coat this morning but now I'll wait a bit longer. The humidity level makes the oil cure slowly.